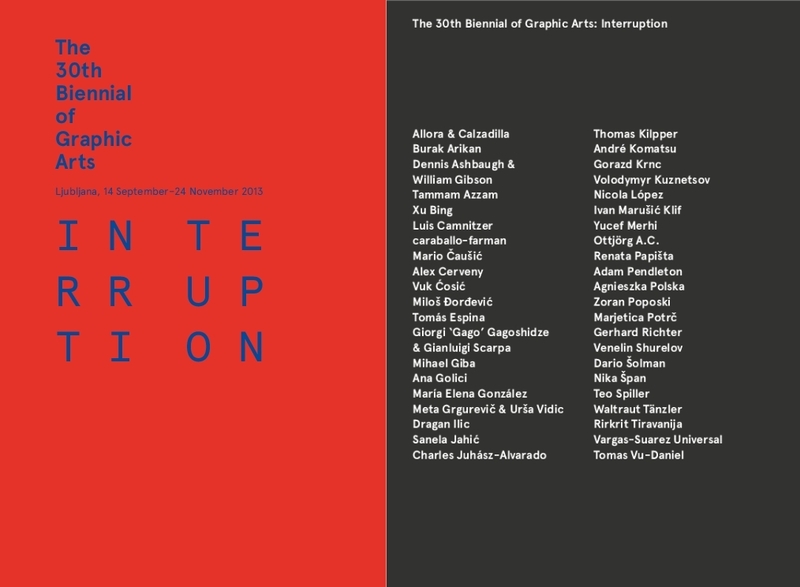 Interruption is the 30th edition of the Ljubljana Biennial of Graphic Arts. This installation considers the evolutionary graphic field of contemporary times. Printerly processes touch many types of present-day art. Select, traditional media have evolved and adapted to maintain their relevance, while digital processes, after a long fermentation, have finally taken legitimate hold as artistic tools in their own right.Interruption surveys the extension of traditional as well as new approaches to printmaking in response to our 21st-century communications. The curator of the 30th Biennial of Graphic Arts in Ljubljana is Deborah Cullen, Director and chief curator of the Miriam and Ira D. Wallach Art Gallery at Columbia University in New York. 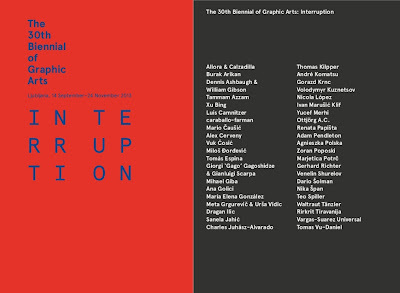 Allora & Calzadilla, Burak Arıkan, Dennis Ashbaugh & William Ford Gibson, Tammam Azzam, Xu Bing, Luis Camnitzer, caraballo-farman, Alex Cerveny, Mario Čaušić, Vuk Ćosić, Milos Djordjevic, Tomás Espina, Giorgi Gago Gagoshidze Gianluigi Scarpa, Mihael Giba, Ana Golici, María Elena González, Meta Grgurevič and Urša Vidic, Dragan IIic, Sanela Jahić, Charles Juhász-Alvarado, Thomas Kilpper, André Komatsu, Gorazd Krnc, Volodymyr Kuznetsov, Nicola López, Ivan Marušić Klif, Yucef Merhi, Ottjörg A.C., Renata Papišta, Adam Pendleton, Agnieszka Polska, Zoran Poposki, Marjetica Potrč, Gerhard Richter, Venelin Shurelov, Dario Šolman, Nika Špan, Teo Spiller, Waltraut Tänzler, Rirkrit Tiravanija,Vargas-Suarez Universal and Tomas Vu-Daniel. Miklós Erdély (1928–1986)—artist, architect, writer, poet, and filmmaker—was a major figure in the neo-avant-garde and conceptual art of Hungary. The exhibition of Erdély’s photographic works, indigo works and drawings has been organised with the co-operation of the Miklós Erdély Foundation (EMA). Curated by Annamária Szőke. In conjunction with the 30th Biennial of Graphic Arts there will be a one-day international conference: “Password: Printmaking” (18 October, Museum of Modern Art, Ljubljana).